WooCommerce Stats 2019: How Many Websites Use WooCommerce? I’m writing this post to give you the latest WooCommerce stats for 2019. It’s not easy to find out how many websites use WooCommerce, as most usage stats are out of date. I’ve done the research to provide the very latest data on the number of websites using WooCommerce. I’ve also provided stats on the market share of WooCommerce compared to other e-commerce platforms and WordPress e-commerce plugins. The results are really interesting! How many websites use WooCommerce in 2019? What percentage of online stores used WooCommerce in 2018? How does WooCommerce market share compare to other WordPress e-commerce plugins? How many WooCommerce themes are there? And how many WooCommerce plugins are there? How many new websites are installing WooCommerce? What is the future of WooCommerce beyond 2019? Annoyingly, this stat is no longer readily available. The new ‘improved’ WordPress.org plugin directory was released in April 2017 and removed the ‘Active installs’ stat. The WooCommerce.com homepage publishes the exact number of WooCommerce downloads. I’m not sure how often this stat is updated and it may include plugin updates as well as as new installs. The current figure is 58,511,613. Check back regularly to get the latest figure for the number of WooCommerce downloads in 2019. BuiltWith reports that in January 2019, a total of 2,906,789 websites use WooCommerce, or 53,045 of the world’s top million websites. That’s 0.6% of all websites, or 5.3% of the top million websites. A sizeable proportion but not huge. 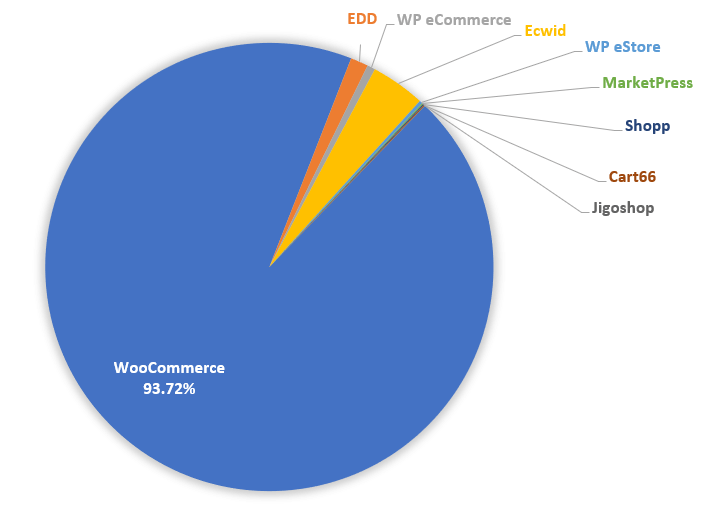 While the number of websites using WooCommerce is interesting, I find it more interesting to look at the % of e-commerce websites that use WooCommerce. This is where WooCommerce really starts to stand out in the stats. 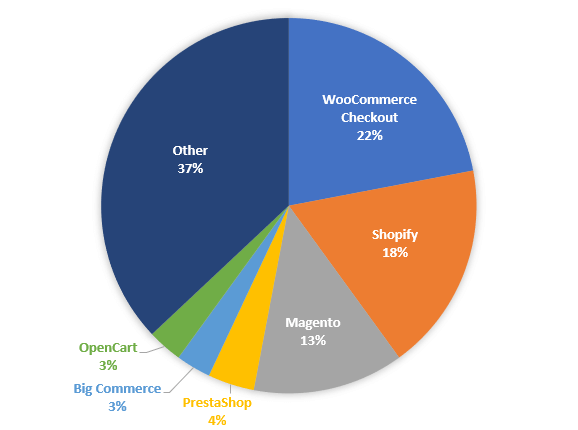 What percentage of online stores use WooCommerce in 2019? The WordPress.org WooCommerce plugin page claims that WooCommerce now powers “30% of all online stores“. But since WooCommerce.com published an article in 2015 with that figure, it’s unlikely the stat is up to date. I find it really interesting to compare WooCommerce usage stats with other e-commerce platforms. This makes the figures more real and helps us to understand WooCommerce’s true market share in 2018 and going into 2019. I’m always surprised to see just how far ahead WooCommerce is compared to other e-commerce platform. Where are the other WordPress e-commerce plugins? You’ll notice that no other WordPress plugins appear in the list at all. These are obviously covered by the big ‘Other’ category, but no other WordPress plugin makes the top 10 e-commerce platforms. It may feel as if plugins such as WP eCommerce and Easy Digital Downloads are very popular, but they’re not even in the top 20. How do WooCommerce stats & market share compare to other WordPress e-commerce plugins? Next, we’ll look at the market share of WooCommerce compared to other WordPress e-commerce plugins. I have created the following charts using stats from Built With. 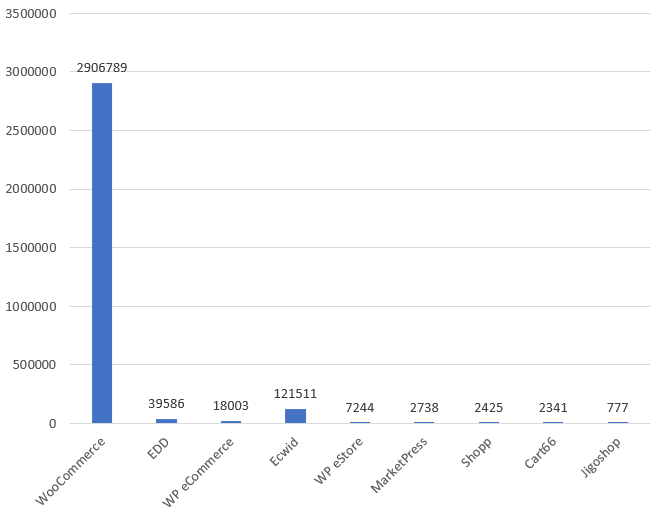 They show the 2019 market share and usage stats for WooCommerce and all the other main WordPress e-commerce plugins. This shows that the competitive advantage of WooCommerce is even greater when compared to other WordPress e-commerce plugins. An amazing 93.7% of all WordPress e-commerce websites use WooCommerce instead of another plugin. Ecwid is the second most popular, followed fairly closely by WP eCommerce and Easy Digital Downloads. But none of them even come close to WooCommerce in the stats. There are 1,217 WooCommerce themes on ThemeForest. The WordPress.org theme directory has 902 WooCommerce themes. Mojo Themes has 238 WooCommerce themes. This brings us to over 2,000 just from 3 big players. The total number will be even higher, so there’s clearly no shortage of choice in choosing a WooCommerce theme for a website design! Our friends at ThemeIsle have some good WooCommerce themes if you are looking, or here are some free themes. Strangely, the official WordPress.org plugin directory doesn’t let you filter by WooCommerce plugins. However a quick count showed that there are well over 6,000 plugins with ‘WooCommerce’ in the title. The CodeCanyon marketplace sells 1,543 WooCommerce plugins. WooCommerce.com sells 286 official WooCommerce plugin extensions. The real total for this stat will be much higher as a huge number of websites sell e-commerce plugins independently or via smaller marketplaces. For example, we sell our own WooCommerce add-ons via our own website, so popular plugins such as WooCommerce Product Table aren’t even included in this figure. It’s easy to get the latest figures on the number of websites which are newly installing WooCommerce, if you know where to look. An up to date figure for this WooCommerce stat is available at all times on the WooCommerce page in the WordPress plugin directory. At the time of writing (January 2019), WooCommerce has been installed 774,273 times in the last week. That’s pretty incredible and shows how quickly WooCommerce is growing. I don’t think I’m alone in predicting that WooCommerce will continue gaining market share in future. It has already reached a tipping point. With such a huge ecosystem of WooCommerce experts, themes, plugins, and hosting to choose from, choosing WooCommerce provides an immediate advantage for any e-commerce website compared to other platforms. If you haven’t started making money with WooCommerce yet, there are plenty of excellent WooCommerce tutorials on how to get started with WooCommerce in 2019, such as these ones from Moosend and 000webhost. WooCommerce is now owned by Automattic, the company behind WordPress.com. This puts lots of exciting new developments in the pipeline such as the likelihood that WooCommerce will become available on WordPress.com. This will bring it to a whole new market, increasing market share even further in 2019 and beyond. With all this in mind, I’m pretty sure that WooCommerce isn’t going anywhere – or at least not for many years. Barn2 Media is a UK WordPress company run by husband and wife team Andy and Katie Keith. Established in 2009, their innovative WordPress and WooCommerce plugins are used on thousands of websites in over 75 countries worldwide. Katie your stats seem to be faulty. You must have compared woocommerce with number of eCommerce sites worldwide and not number of websites worldwide. They're not faulty, that's just a different stat! I think it's more relevant to compare the number of WooCommerce sites with the total number of e-commerce sites rather than the total number of websites in the world. It's interesting to compare the number of WordPress sites with the total number of websites as that is a complete website platform, whereas WooCommerce is just an e-commerce platform so I compared it to e-commerce sites only. That's the right answer. Great write-up by the way. The question asked by apoorve is not right i also agreed with kathie reply.Woocommerce is diffrenet from other website it is to be compared with ecommerce sites only. Great write up. No doubt WordPress Woocommerce has expanded its limitation which wasn't present before which make it favorable for newbie to launch their store easily. But still there are few flaws like website with more than 1000 products loads slow which ultimately leads to lose the potential customers which is not a good sign in long term because something everything is going right still thing doesn't work. I have seen several experts recommending cache plugins to speed up the process but I personally think cache plugin like Breeze or W3 Total Cache can push to some extend but after that you are left helpless. Thanks for your comment. I watched a talk once about someone who scaled WooCommerce to 1 million products, and it loaded in less than a second. So anything's possible! One easy way to display more products without performance issues is to use our WooCommerce Product Table plugin. It comes with a lazy load option which only loads 1 page of results at a time, so you can have an unlimited number of products without any performance problems. Some features are limited with lazy load, but you can still filter the table by category, tag, attribute or custom taxonomy, so it's a very quick way to find products in a large store. WordPress has this great feature that it shows the active installs of each plugin hosted in the Plugin Directory. WooCommerce is hosted right there, so you can easily check the number of sites: WooCommerce - as of September 19, 2017 there are 3+ million active installs of WooCommerce. This means that at least this number of unique WP sites requested the update information from the Plugin Directory in a 30 day period. and I can see WooCommerce on 8% and Shopify on 11%. Hi, you need to click on the 'Whole internet' option - WooCommerce largely (but not exclusively, of course) attracts smaller websites so when you look at the stats for the world's top million websites, the market share is lower. New shops mainly start with woocommerce. Of course they will not enter the Top10k within 5 years. And the old big shops will not disappear or switch to woocommerce. Magento-shops still work good, but they are not attractive for new companys. Great insight into WooCommerce stat. Thanks for sharing Katie. I Totally Agee with the stats. Whole internet' option - WooCommerce largely (but not exclusively, of course) attracts smaller websites so when you look at the stats for the world's top million websites, the market share is lower. If you’re familiar with WordPress, then installing and setting up WooCommerce should be very easy for you. Send me new blog posts and tutorials by email.